Indian paint manufacturing company Berger Paints has chosen to set up a plant in the Russian town of Nevinnomysk, in the Stavropol region. The decision to locate their paint and varnish manufacturing centre there was taken after a group of Indian investors visited to the town’s industrial park. 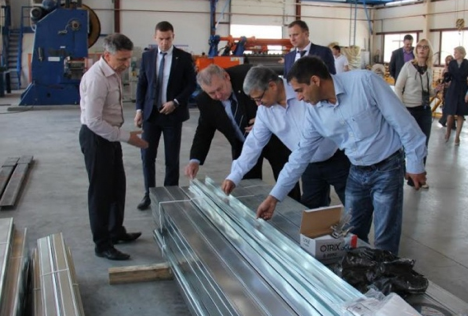 Indian investors recently visited a Russian regional industrial park “Nevinnomysk,” along with regional officials, Vasily Shestak, First Deputy Head of the Nevinnomysk administration, and Dmitry Tolmachev, Deputy Minister of Energy, Industry and Communication of the Stavropol region. After examining some of the other functioning enterprises and exploring the options, the Indians decided to set up a paint manufacturing factory there. Vladimir Vladimirov, governor of the region, and Kuldip Singh Dhingra, owner of Berger Paints, one of India’s biggest paints and varnish manufacturing companies, had, in February 2015, in New Delhi, signed an agreement on cooperation, to establish an industrial and domestic paint and varnish manufacturing unit. Berger officials are finalizing a site for the factory, for which 4 to 6 hectares of land are required, at “Nevinnomysk”. The company plans to invest at least 5 million dollars in the project and create at least 50 jobs. According to local residents, it makes sense that Nevinnomysk was selected as the location for the new plant, because it has a highly developed transportation and logistics infrastructure for industry. The regional industrial park began functioning in 2010 as a pilot project for the region. In 2012 it received a certificate from the Association of the industrial parks of Russia with an “active” status, and confirmed it in 2014. The value of investment in projects at the park is 16.74 billion rubles. Investors have already paid 7.5 billion rubles. Of the 1255 jobs envisaged, 624 jobs have been created, around 80% of all jobs created in the town. Active enterprises have produced goods worth almost 2 billion rubles, and actively contributed to the town’s budget, thus improving conditions in the town and the region. Based on materials from Mangazeya Information Agency.